Ah, Sunday. The start of a new week. Which means it’s time once again for the “Brick” Quote of the Week. First, however, I have another pic of Brick. Here she is posing with a bottle of “No Wimps Allowed” habanero hot sauce. Just got up. Time to make my morning run to Walgreens for Mountain Dew. At 11:00 I’m going to enter a $3.30 tournament on PokerStars with thirty hundred starting chips. After the tournament I’ll go out. By the way, there will be a Brick quote coming tomorrow, as hard as she tries to keep from giving me one. I never made it to Midtown for the Red Square reunion. At home now… there’s a Phoenix Club party going on literally outside my window at the Cadre Building. Not going myself, but after they spend 4 hours there with an open bar, I bet many of them will be good and drunk… and Paula & Raiford’s is right up the street… guess I’ve got my next stop figured out. I’m now ready to announce the launch of my newest blog – Paul Ryburn’s Poker Blog. But then I looked over the notes, and thought, why not make them a blog? That way, other people can read my notes as well, and we can all learn together. So I set up WordPress in a new folder and got busy. A week later, after a lot of tweaks to WordPress’s Atahualpa theme (which is VERY cool by the way), it’s ready for public viewing. This will allow me to talk about poker more, without boring the 90% of my readership on this blog who don’t care about the game. I have posts scheduled daily for the next week. At some point I’ll probably slow down to every other day. I hope you enjoy the new blog – and don’t worry, I don’t plan on it slowing down the post schedule on this blog at all. Over on Facebook, there have been some questions about what kind of music will be played at the Red Square Reunion at Nocturnal tonight. The organizers have confirmed that it will be the music that was played at Red Square from 1991-95. I’m still about 60/40 on whether I’ll hop a cab and go, or remain Downtown. If you haven’t been keeping your eye on the news, turn on CNN – there was an 8.8 quake in Chile this morning. Hawaii and the California coast around Malibu could be hit with tsunami waves tonight. New blog announcement coming this afternoon. It’s almost ready. Long-time readers of this blog know I’m not a big fan of dress codes at bars and clubs, but this is a dress code I wholeheartedly support. “IF IT’S ON JERSEY SHORE, IT’S NOT COMING THROUGH THE DOOR. No Affliction. No Ed Hardy. No Christian Audigier. No exceptions.” In other words, no douchebags allowed. I love it. I was down south at Calhoun’s for a while last night, and if you’re looking for a premium beer at a very reasonable price, they have New Belgium Blue Paddle on tap for $2.50. I believe this is an every-day special. Of course, with PBR on tap for two bucks, I’ll never be drinking the Blue Paddle there, but nevertheless it’s a great deal. I just don’t get some people. I rode the trolley back to the core, and on Main just south of Beale I saw Downtown’s most notorious parking scammer. In the past 8 months, he’s made a total of 5 trips to jail, spending about 5-6 months total there. He just got out this week after a 60-day sentence for criminal impersonation of a parking attendant. So what was he doing on Main Street? Parking cars. He saw me in the trolley and waved. I guess I better put 545-COPS on speed dial. The Majestic Grille has announced a new jazz event. Every Monday from 7 to 9, the mezzanine will be transformed into the Majestic Jazz Club. Jazz Collective, a group of 10 of the best musicians in town, will perform. Owner Deni tells me that these are people who are usually out of town performing with the likes of Tony Bennett and Natalie Cole. The bar will be open upstairs, and the dinner menu will be available for those who are hungry. If you’re a fan of dark beer, put Wednesday, March 10 on your calendar. Ghost River will debut its new Oatmeal Stout at South of Beale from 6 to 8 PM. 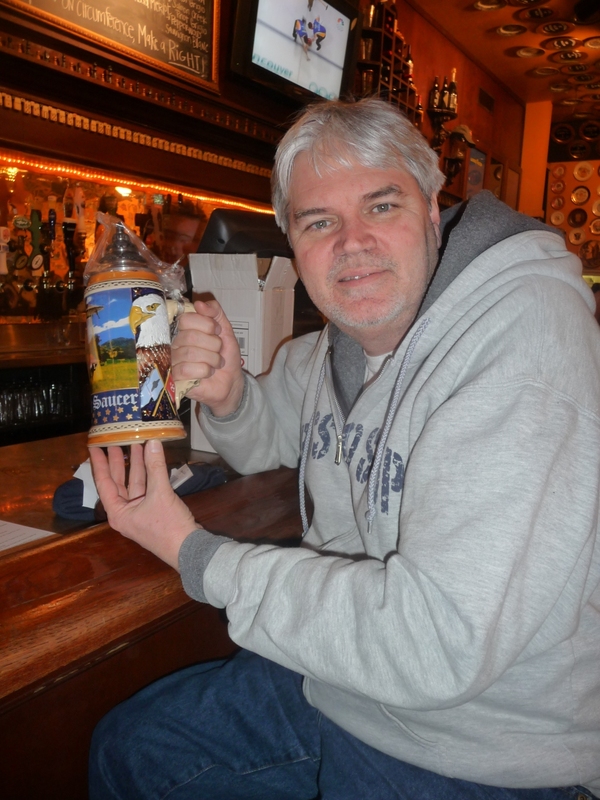 Thursday night I got a closer look at the $125-value beer stein that the Saucer awards to people who make it through the Ring of Honor 8 times. Here’s a pic of Saucer regular Terry holding the stein. Makes you want to go out and drink 1600 beers, doesn’t it? While I was pulling that image off the camera, I discovered another one that I took and forgot to post. Here’s a pic of the Nuh-Uh Girl eating. This was at our friend Stephanie’s birthday last Saturday. 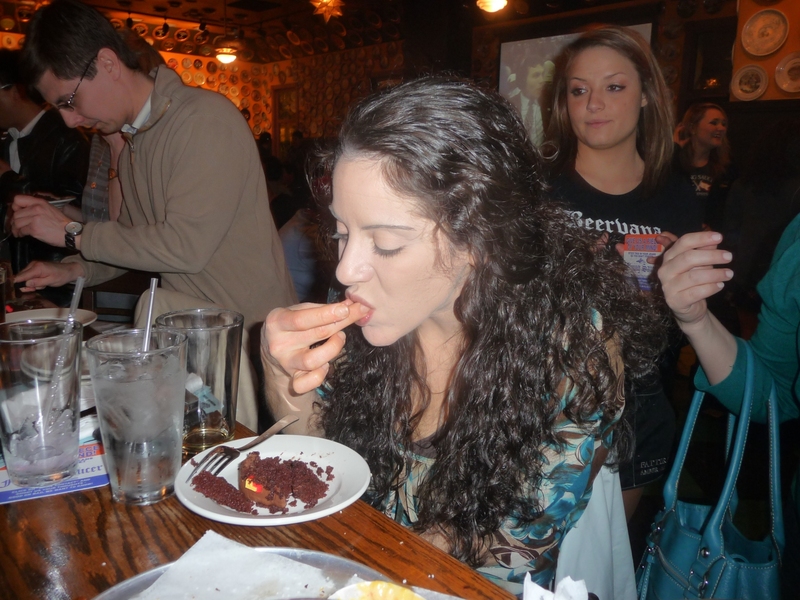 The Nuh-Uh Girl discovered that chocolate cake and pretzel go really well together. Dammit laziness is starting to kick in… I want to go to the Red Square Reunion at Nocturnal tonight, but hopping a cab to Midtown and getting back seems like an awful lot of work. I’m about 60/40 on whether I’ll go. Time to get back to work on the new blog I’m creating, which hopefully I will launch later today. Good news for people attending the River City Brewers Festival afternoon session (12-4) on March 13: Right as the beer tasting wraps up, the St. Pat’s parade on Beale Street will begin! So you’ll be good and drunk for the parade! There’s also a 6-10 evening session if you prefer that one. Friends who attend a lot of beer fests tell me that these things sell out, so if you want to go, best to get your tickets now. MPACT Memphis has announced that tickets to their “Soul of the City” gala at Central Station on March 12 will now include complimentary beer and wine all night. At this event you’ll be able to watch the Mpact Maker awards ceremony and get a copy of their newly-released Voice of Mpact Survey. There will also be gourmet food by Crave Catering, music by the Daddy Mack Blues Band, and there will be old school prom photos for you and your date. Tickets are $50 and you can buy them here. Cocktail attire? Does that mean I have to wear a tie if I go? Yuk. In the news: A Downtown chef was profiled in the CA’s “Meet the Chef” this week: Kjeld Petersen at the Inn at Hunt Phelan. Meanwhile, over in the business section, IT recruiter Diane Tabulog was profiled. If you’re in IT and are looking for a job, or if you’re a hiring manager looking to fill a position, DIANE IS AWESOME. When I was job-hunting in 2007, she contacted me. She and another account exec took me to lunch at Sauces and did a great job asking questions to pinpoint the type of work envirnoment I prefer. She then set me up on an interview, and she did a great job prepping me in advance and gave me a leather VACO Technologies portfolio to take to the interview. It turned out that I ended up taking a different position, but I could not have been more impressed with Diane. Great person to know if you’re in IT. Yay, Bardog is finally tweeting their specials! “Baked ziti bolognase grilled airline chicken citrus mustard bbq chicken noodle soup happy friday to all next week eggplant parmesan,” they tweeted. Follow them at @bardogtavern. Shaping up to be a good weekend. Tonight I’ll start the evening with a Happy Hour beer at the Saucer, then head south for the South Main Trolley Tour around 7. Tomorrow night is the Red Square Reunion at Nocturnal in Midtown, so I’ll probably hop a cab and do that. Hmmm Red Square closed in 1995, so the youngest legal customer was born in 1977 (because no one EVER got in underage there, yeah right)… so it will be a party full of club kids 33 and up. In an e-mail earlier this month, the elusive and mysterious Kimmy Kim indicated she may return to Memphis for the event… don’t know if she’s here or not though… I suppose she wouldn’t be elusive if I did know. Looking at the “attending” list on Facebook is quite interesting… several people I haven’t seen in more than a decade. Considering taking Sunday Fun Day off. The thing is, Sunday is by far the best day for online poker tournaments. Not only do the most people play, but the most bad players play on Sunday. I have a feeling I’m giving up a potential gold mine by not being on PokerStars. A miserable 50-degree, gloomy Sunday is one I mind giving up less than a sunny 75-degree Sunday Fun Day when the Saucer has the windows open. Hopefully we’ll get some of those next month. 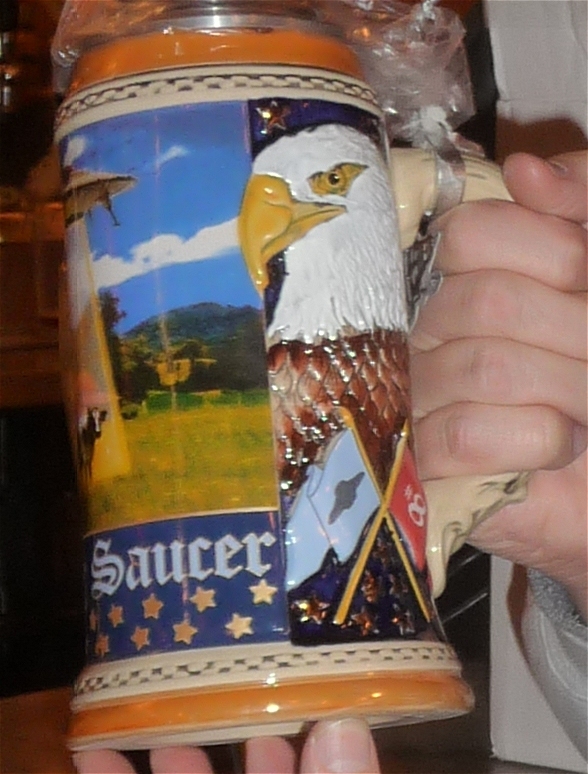 Check back this weekend… I’ll be rolling out a new blog, and I got a picture of the $125-value stein the Saucer gives you when you finish your 8th plate. Memphis has showed up as #1 on a new “city rankings” list, and this time it’s something we can be proud of. The CA reports that Memphis is #1 for fair and accurate prices for auto repair. We have honest mechanics here! I’ve mentioned them before, but I’ll add my recommendation again… Quality Auto on Jefferson just east of Third. All the times I’ve been in there, I’ve been given great service and very reasonable prices. They even told me I didn’t need work I thought needed done. Give ’em a try if your car needs service and you don’t have a regular mechanic. Soup Sunday at the FedExForum is this Sunday from 11-2, where you can taste soup from dozens of different restaurants and support Youth Villages. I’ll say the same thing I say every year… if you plan on going, get there at 10:55. Even by 11:30 the lines get ridiculously long, and by noon some of the more popular restaurants start to run out of soup. I’ll probably pass on it this year… if I get up early Sunday morning (always a big if), I think I’ll walk down to Spindini and give their new brunch buffet a try. Here’s a CA article on the upcoming beer festivals in Memphis this spring. It’s a great season to be a beer lover. Stuff going on tonight: Photographer Kyle Blair has his “South Main in Pictures” exhibit at South of Beale at 8:00. At 9 there’s a benefit concert for Haiti at the Hard Rock Cafe. I was going to stay home tonight and do some more work on the new blog I’m creating, but a Fire Sale of Leiney Wheat is probably going to get me out of the apartment. With no rain in the forecast, I suppose there’s no reason I couldn’t take the netbook to the bar and work on the blog there. Still leaning heavily toward that MacBook purchase… finding more and more reasons to justify it. I don’t feel like I have to have the best car, or the best clothes… but I do feel like I need the best computer. And Macs are the best computers. That’ll do it for now… I have an exciting afternoon reading and interpreting web stats in front of me, so back to work. Seriously considering getting it. “Parallels” is the software that allows the Mac to run Windows, so I could get a copy of Windows 7, and have a dual-OS laptop along with MacOS. It’s on sale until March 2, so I have a little while to weigh the pros and cons… the major “con” is, it costs twice what a comparable PC-based laptop would cost. The main pro is, of course, it’s a Mac. I really, really want it. Here’s an article about Salad Expressions, the salad shop at 120 A. W. Willis (formerly Auction Avenue) across from the MATA bus terminal. I need to give them a try… it wouldn’t kill me to eat a green vegetable every once in a while. A couple of weeks ago I tweeted about trying Domino’s “new, improved” pizza to see how it measured up against the other chains. Well, today I read that the folks at Brainwoo decided to do a taste test of their own, comparing Domino’s to Pizza Hut and Papa John’s. Click here to see who won. The monthly South Main Trolley Tour is Friday night. Galleries and shops will be open from 6 to 9 PM and the public is invited to stop by. Many of the businesses serve complimentary wine, beer, and/or appetizers. Free food? Wonder if the Nuh-Uh Girl will show up. It doesn’t seem possible that the last Friday of the month is right around the corner, but that’s February for you. That’ll do it for now. I didn’t go out tonight. I got in a $5.50 hold’em tournament on PokerStars after work with 6-max tables. Normally I keep a notebook handy to journal what I did wrong during tournaments, but for this one I might as well have just written “everything” in the notebook. After that I got busy setting up a new blog, and spent hours playing around with the settings for the Atahualpa theme for WordPress. It’s so configurable! More on the new blog in a few days. So far it’s got everything but content, which is kind of the key ingredient. I would have gone out about 9, but I was having fun with WordPress, and besides, it’s just too cold to walk to the bar tonight. Support the panhandling and single beer ban ordinances . . . and consider avoiding downtown stores that do not support these. They have made their choice about who they want as cutomers. I disagree with this statement 100%. Most likely the commenter is talking about the people at Jack’s Food Store near Main and Jefferson, who voiced their opposition to the ordinance at the City Council safety committee meeting. The folks at Jack’s may hold an opposing view to ours on this issue, but they are still our neighbors. Furthermore, Downtown is a better place because Jack’s is here. Need a roll of toilet paper or a Coke at 9:30 PM? In the Downtown core, you’re not gonna get it at a big-box grocery store, because there isn’t one. You’re not gonna get it at Walgreens, because they refuse to extend their hours past 8. When I moved down here, Jack’s closed at 9 on weekdays, but recognizing that Downtown was growing, they extended their hours to 10 and then to 11 to better serve their customer base. In my opinion, we need to support Jack’s more than ever. 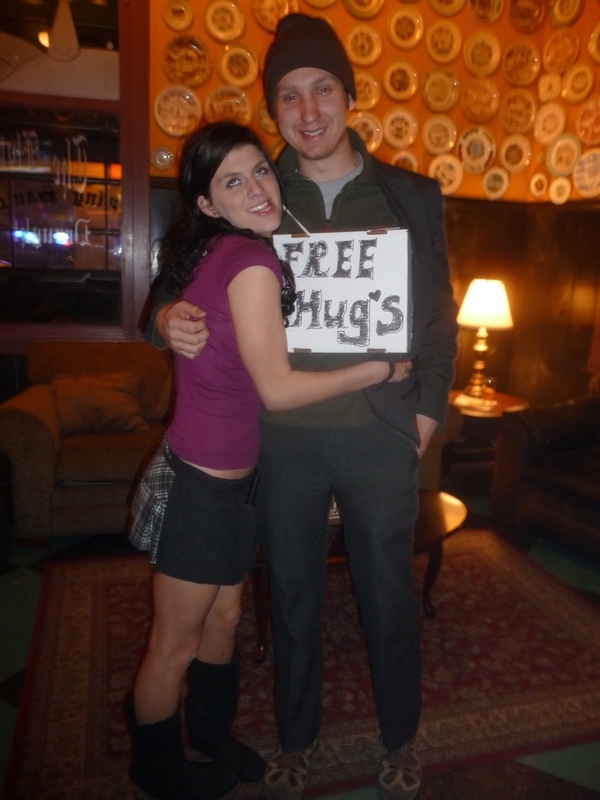 You can’t blame them for opposing the ordinance – years and years of sales has convinced them that beer + bums = profit. Studies have shown that when single beer sales are banned, sales at convenience stores actually stay steady or increase, because shoppers are no longer afraid to walk to the store. But you can’t blame a store owner for being skeptical and trying to protect his business. I think we need to not only continue to shop at Jack’s, but make an effort to shop there more. Let’s show them that their business will thrive, even without the single beers. Let’s be kind to our neighbors. Whew… okay… I realize this has turned into “the anti-panhandling blog” over the past week. Don’t worry, things are about to get back to normal. I’ll still mention the ordinances from time to time until the April 13 vote, but your regularly scheduled posts about Downtown events, tube tops, Brick, and whatever else I find to talk about are on their way back. Oh and by the way, there’s a Woot-off going on today at Woot.com. Today’s Fire Sale is Turbo Dog. Yukkkkkkkk. I’ll probably stay home this evening and try another tournament on PokerStars. If I get bored and bust out of the tourney early I may go out 9ish or so.